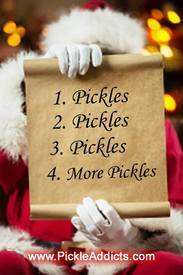 You've handed out all of your gifts, but we saved the best gift for last...PICKLES!! Get 10% off everything at Pickle Addicts .com (plus FREE shipping!). No minimum purchase required. Discount will be applied only if you use the link above. Limited time offer, discount ends at 11:59pm EST on 12/31/2017. Offer for new orders only, cannot be applied to past or pending orders.